When the United States entered World War II, it subjected Italian nationals living within its borders to legal restrictions and labeled them enemy aliens. Several thousand of these people and some U.S. citizens were arrested and underwent flawed hearings; hundreds were interned. 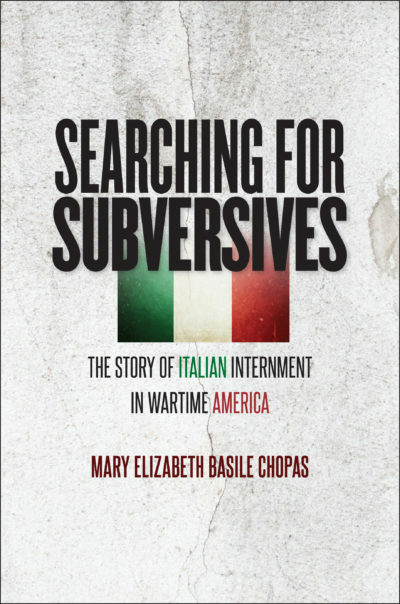 Shedding new light on this injustice, Mary Elizabeth Basile Chopas’s Searching for Subversives (University of North Carolina Press, 2017) describes how government and military leaders constructed wartime policies that affected Italian residents. Based on new research, this in-depth legal analysis uncovers many layers of repression not previously revealed in scholarship about the wartime home front and demonstrates the lasting social and cultural effects of government policies on the Italian American community.